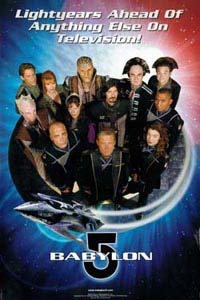 RAWIllumination.net: Did RAW write a 'Babylon Five" script? After his speaking engagement at Treadwell's in London, Ian "Cat" Vincent chatted with other Robert Anton Wilson fans and picked up an interesting story (or rumor, or fact): That Wilson wrote a script for the Babylon 5 TV show. "Interestingly, guy in pub after my talk said RAW had submitted a B5 script!," Vincent wrote on Twitter. Comes from a RAW lecture/interview, source could not remember where. Story goes; submitted as full script, was used in full or in part without credit." I wrote to Richard Rasa, projects coordinator for the Robert Anton Wilson estate, and asked if he knew anything about the report. He replied that he didn't know anything about that, but would ask Christina Pearson, Wilson's daughter. If I learn anything else about this, I'll follow up. Tom I believe he talks about it in the audio interviews "RAW explains everything, or old Bob exposes his ignorance". It sounded like he didn't submit a script to Babylon 5, but rather was devising his own show/film which then had several major themes ripped off from it.